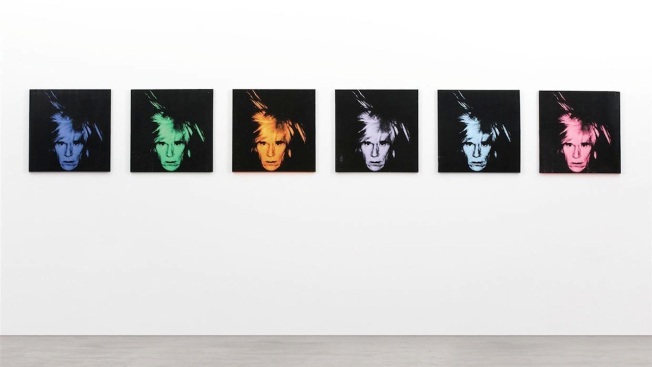 "Six Self Portraits" by Andy Warhol sold for $30.1 million. In all, Sotheby's sold 67 pieces Wednesday for a total of $364.4 million. All prices included the buyer's premium. Casino magnate Steve Wynn purchased Jeff Koons' 7-foot-tall stainless steel sculpture of the spinach-loving cartoon character "Popeye" for $28.2 million and will put it on display at his Wynn Las Vegas property in Nevada, Sotheby's said. Koons' "Jim Beam J.B. Turner Train," a 9½ -foot-long-stainless steel sculpture filled with bourbon, sold Tuesday for $33.8 million. German painter Gerhard Richter's "Blau" sold Wednesday for $28.7 million, about $9 million shy of his auction record set last year at Sotheby's. Jean-Michel Basquiat's "Undiscovered Genius of the Mississippi Delta" sold Wednesday for $23.7 million.